It’s not attractive, and it itches. Grab one of the best dandruff shampoos for men and solve the problem today. Although dandruff is nothing to be ashamed of, nobody wants it either. Switch to a new shampoo to diminish the flaking and itching after only one wash. Your scalp might be overly dry, so it’s flaking. But chances are there is an out-of-control fungus on your scalp. You can kill the fungus and treat the symptoms depending on which shampoo you use. One of the classic solutions for dandruff is pyrithione zinc, the active ingredient in Head & Shoulders and similar products. On the other hand, Selsun Blue contains selenium sulfide while Nizoral has ketoconazole, a powerful anti-fungal. If you take the natural route, you might find that tea tree oil, or Melaleuca, helps clear up the infection, too. Next, it’s important to treat the symptoms. First, there’s coal tar as found in Neutrogena T/Gel. The coal tar reduces irritation and mitigates the skin’s extreme reaction to the microbes. Also, some anti-dandruff shampoos contain salicylic acid. This reduces the flaking so that you can have a clear scalp. You’ll find that ingredient in Neutrogena T/Sal. Finally, you can maintain a healthy scalp and hair by steering clear of shampoos with sulfates and harsh ingredients. 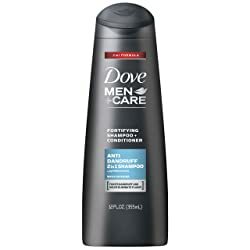 We selected the top dandruff shampoos for men and reviewed them here. We hope our selection helps you find exactly what you need. Nizoral’s shampoo eliminates the fungus that causes dandruff. It uses the anti-fungal ketoconazole, which binds to your hair’s protein. In that way, it continues to work throughout the day in between shampoos. It also has an interesting side effect of combating hair loss. Users who prefer Nizoral to other brands comment on a few important points. To begin, it’s not necessary to use the shampoo every day. Just twice a week keeps dandruff under control. After that, it’s pleasant to use because it creates a lot of lather that rinses clean without a lot of effort. Plus, it has an agreeable scent and it’s safe for color-treated hair. An attractive lemon-lime fragrance revs up this version of Head and Shoulders. Since it’s a two-in-one product, you don’t need to hog all the space in the shower with a bunch of bottles. The pH-balanced formula features 1% pyrithione zinc, a proven cure for dandruff. If regular anti-dandruff shampoos aren’t getting the job done, you might need this Clinical Strength version. It clears up seborrheic dermatitis and regular dandruff to get rid of oily flakes and itching. It’s based on 1% selenium sulfide, a time-tested remedy that works on all hair types. Also important, the formula moisturizes the hair to make it shiny and soft. The shampoo penetrates into the scalp to stop itching and dryness as well. Neutrogena’s T/Gel needs to sit on your hair and scalp for a few minutes before you rinse. That gives time for the coal tar extract to resolve itching and flaking. This is one of the top choices for treating scalp psoriasis and seborrheic dermatitis. Moreover, you only need to wash with it twice a week to enjoy a healthy scalp. The difference between Neutrogena T/Sal and T/Gel lies in their active ingredients. The T/ Sal shampoo relies on 3% salicylic acid to exfoliate the scalp. Plan on washing with this fragrance-free formula at least three times a week to remove crusty buildup and alleviate excess dryness and flaking. It also helps with acne along the hairline. Again, let it sit for a few minutes before you rinse for best results. Selsun Blue is another classic solution for dandruff. It contains selenium sulfite and menthol to relieve itching. There is something important to note about selenium sulfide. Some blond or gray-haired people have noticed that it discolors their hair. Others have found that it tends to make their scalp either oilier or drier. 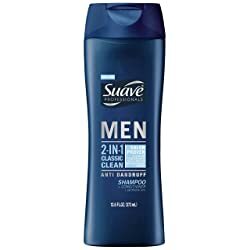 Suave’s shampoo/conditioner is a budget option for clearing up dandruff. It uses pyrithione zinc to control dandruff. But it has an additional feature in that it reduces sebum production. As a result, the hair and scalp end up less oily. If you have thinning hair, Dove’s anti-dandruff shampoo/conditioner is designed especially for you. It has both pyrithione zinc and caffeine. The former gets rid of the root cause of dandruff while the latter stimulates the scalp to improve hair growth. Some users have said that it leaves their hair dry and they recommend following up with a conditioner. Dove offers both Defining Pomade and a Sculpting Paste to manage fine strands. Dove’s DermaCare 2-in-1 formula also has 1% pyrithione zinc plus eucalyptus. The pH-balanced shampoo rinses away residue and flakes while improving the scalp’s health. At a minimum, plan on using it twice a week. Head and Shoulders Charcoal for Men comes with a satisfaction guarantee. Try it, and if you’re not happy, you can return it for a refund. It literally contains charcoal to draw out excess oil and impurities from the scalp. But it also has 1% pyrithione zinc to kill the fungus that causes dandruff. Furthermore, this inexpensive option has an enjoyable citrus scent. The Redken Brews shampoo employs pyrithione zinc for dandruff relief. Although the container resembles a beer bottle, the shampoo itself smells like ginger. Fans of this product appreciate the fact that the unusual aroma doesn’t have a medicinal essence. It also doesn’t leave the hair frizzy or dry as some dandruff shampoos do. L’Oreal’s Elvive for Men features their proprietary Actirox + Equaderm formula. They promoted as an all-around solution for clearing up dandruff and restoring the scalp’s natural balance. We peeked behind the scenes to see what ingredients might be involved in this process. We discovered that, once again, it’s a dandruff shampoo with pyrithione zinc. It also has glycerin, fatty alcohols, aloe, and coconut derivatives that add moisture. L’Oreal’s Homme Cool Clear blends the power of pyrithione zinc with menthol and tea tree oil. Together, these three blast away dandruff and purify the scalp. Users say it’s a refreshing shampoo that leaves their hair soft and shiny. This dandruff shampoo for men is typically sold overseas. It’s advertised as a strengthening product for normal hair. Plus, it contains bamboo, a unique ingredient that helps reduce itching. If you have sensitive skin, skip all the other shampoos with artificial fragrances, dyes, and harsh chemicals. It’s not worth triggering eczema, a psoriasis flareup, or acne just to clear up dandruff. The solution is in Vanicream’s Free & Clear Medicated Shampoo. This is the one choice that stays away from all potential irritants. It has no fragrance, masking fragrance, dye, parabens, sulfates, formaldehyde releasers, or phosphates. But it has maximum strength pyrithione zinc at a 2% concentration. It gets the job done without any frills but leaves hair clean and not overly dry. Let’s branch out to other shampoos with natural remedies for itching and flaking. This one treats oily hair and fights hair loss with tea tree oil and rosemary. It has no harsh sulfates to dry out the scalp or fade color-treated hair. While it may not resolve a severe case of dandruff, it makes a solid companion to use on the in-between days when you aren’t washing with something stronger. The American Crew shampoo blends botanical and scientific answers to chronic dandruff. It has both zinc pyrithione plus natural extracts like rosemary, tea tree oil, sage, and peppermint. As a result, it improves the overall health of the scalp while it relieves flaking and itching. Every Man Jack’s shampoo avoids the stronger SLS and SLES in favor of Ammonium Laureth Sulfate and coconut derivatives. Those surfactants aren’t as drying to the scalp and hair. It also has pyrithione zinc to clear up dandruff. And finally, the addition of panthenol and wheat protein fortifies the hair to keep it strong. AXE’s shampoo plus conditioner has a manly fragrance and zinc pyrithione to keep dandruff at bay. It’s mild enough to use every day. Additionally, the two-in-one format saves time in the shower. 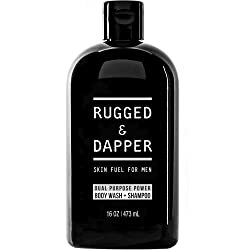 RUGGED + DAPPER keeps it simple with an all-in-one product. This is the only bottle you need in the bath (besides a regular dandruff shampoo). Get this to use on the days when you’re not washing with Head and Shoulders or the like. It will help you maintain a flake-free scalp. Furthermore, the moisturizing formula helps prevent body acne with tea tree oil, orange peel, and rosehip oil. There are a variety of dandruff shampoos on the market. At first glance, it may seem difficult to choose between them. The standard solution for dandruff caused by an overgrowth of fungus is pyrithione zinc. If you’ve tried a shampoo with this active ingredient and not had success, switch to one with ketoconazole. Since the majority of anti-dandruff products only need to be used twice a week, be sure that whatever you use the rest of the time protects your scalp from dryness and irritation.